Red and Chris played at the Gamble Rogers Folk Festival May 2nd through 4th in Florida. Here is Red's account of the trip. Went down to St. Augustine and had fun picking at the GambleFest. The folks liked it, and the band liked it too. Christopher and I traded off guitar and mandolin; we had expert picker Mike Johnson on guitar, Monroe veteran John Hedgecoth on banjo, and Barbara Johnson on bass. We had good mandolin workshops on Saturday and Sunday, with plenty of folks attending and asking good questions. The weather was warm and dry, and the music was hot. Thanks for our friends Michael and Andrea for the excellent picking party and supper at their house on Saturday night, and to the festival hospitality room for meals all weekend and lifesaving coffee on Sunday morning! Reached home after an easy drive, and brought back good memories of the festival. THANK YOU to Bob Patterson, Lis Williamson, and all the generous and dedicated staff and volunteers for a great show! I think the new fairgrounds location is a keeper, and we had a terrific time playing for all the folks. 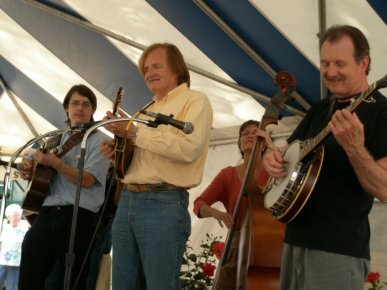 Posted in By Red, shows and tagged chris, gamblefest, mandolin, red, shows on July 6, 2008 by Red Henry. Began playing mandolin, guitar, fiddle, and banjo in 1967-69. I married Murphy in 1974. We led the Red & Murphy bluegrass band, playing professionally, from 1975-87. Since then I've handled the technical side of Murphy Method cassette, videotape, and DVD production. When you call I usually answer the phone, and I'm normally the one who sends out the orders. Red, I watched and listened to the Helton Creek video yesterday and discovered the Soldier’s Joy and Wheel Hoss ones today. All three are great. Thanks for posting them.